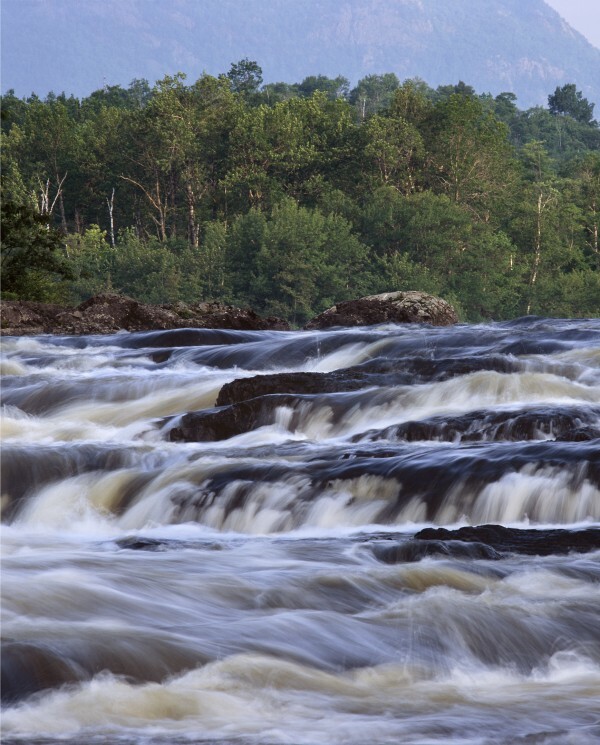 "The Maine Woods" will take guides, members of the Penobscot Nation, scholars and others along the Penobscot River, including this segment of the waterway known as Haskell Pitch. A group of Maine Woods guides, members of the Penobscot Nation, scholars and others will begin a 16-day canoe trip on May 16 to retrace the last of three adventures immortalized in Henry David Thoreau’s book “The Maine Woods.” The expedition, organized by Maine Woods Discovery, will traverse the Maine woods much the way Thoreau did 150 years ago, traveling through a largely undeveloped forested landscape filled with vast lakes and wild rivers. Published in 1864, after Thoreau’s death, “The Maine Woods” was one of the first published accounts of recreational travel through Maine forest land. Organized primarily to commemorate the 150th anniversary of Thoreau’s book, the trip is also will promote the recreational opportunities available in the Maine Woods today. Like Thoreau’s trip, the 150th anniversary tour will begin with a visit to Penobscot tribal territory on Indian Island in the Penobscot River just north of Bangor. Overland transportation will follow the old stagecoach route to Greenville where participants will set off for the two-week canoe expedition, paddling the length of Moosehead Lake, crossing into the Penobscot and Allagash River watersheds, down Webster Stream through Baxter State Park, to the East Branch and main stem of the Penobscot River and south to the starting point on Indian Island. Each two-to-four-day trip segment will feature a specific Thoreau-related focus with experts joining to provide context and commentary on themes ranging from Native American culture to literature, history, ecology, lumbering and conservation. Financial support for the project has been provided by Elliotsville Plantation Inc., Plum Creek Timber and Bangor Savings Bank. A central element of the trip involves engaging members of the Penobscot Nation as cultural guides to the Maine Woods. “Thoreau never could have travelled in the Maine Woods as he did without the support of Penobscot guides, notably Joseph Attean who led him on an 1853 excursion, and Joe Polis who guided the 1857 expedition our group is retracing,” said Mike Wilson, senior program director for the Northern Forest Center. Finley is one of five scholars and historians from across the country taking part in the trip. In preparation for this event, several detailed pages for the expedition have been set up at MaineWoodsDiscovery.com/150Thoreau where the public can review the day-to-day itinerary for the trip, read crew biographies and follow the live progress of the expedition using satellite mapping technology provided by Maine’s Pinnacle Tracking. The public is encouraged to engage with the crew when possible through social media on Facebook at www.facebook.com/MaineWoodsDiscovery and on Twitter @TheMaineWoods using #150Thoreau for all social media tracking.